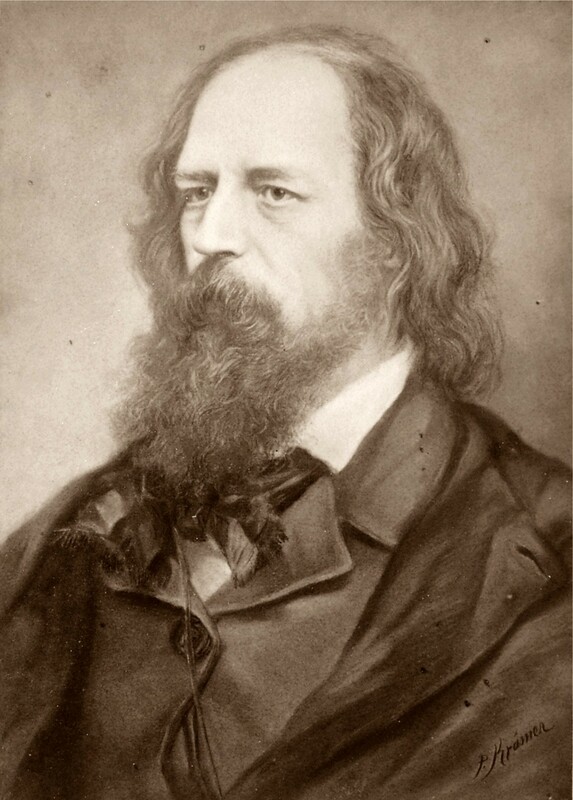 The English poet Alfred, Lord Tennyson lived from 1809-1892. During his life he was hugely popular. He’s still thought of as a major poet. He’s never been one of my favourites, I must confess, even though his techniques are superbly masterful. Some of his poems are too sugary for me. However, “The Kraken” most definitely speaks to my imagination. A kraken is an imaginary sea monster. There have been stories about incredible sea monsters since people starting telling each other tall tales. 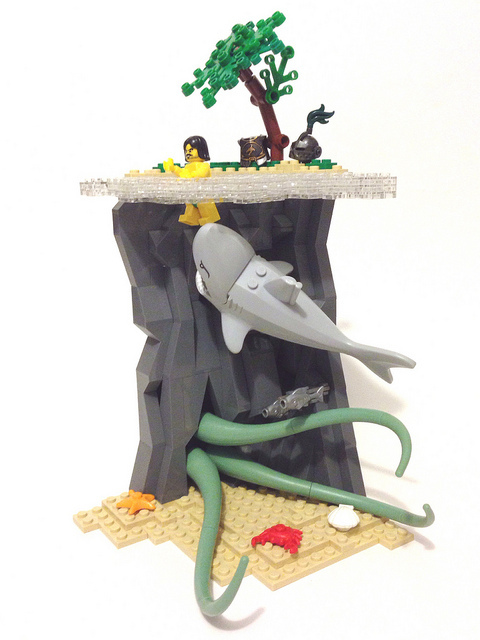 As large parts of the oceans are still unexplored, people have tended to fill in the blanks with scary sea creatures. Think of the Loch Ness monster, a kind of dinosaur (?? ), in a lake in Scotland. From Greek myths we know the Scylla, a beautiful woman with the hind (back) parts of a fish who was later turned into a hideous (= very ugly) monster, and Charybdis, who had flippers instead of arms and legs and who by slurping the water created whirlpools. The Kraken’s origins are from the seas around Norway and Greenland. It’s an enormous monster, as big as a Nordic fjord. It looks like a giant octopus or squid or something like that. Its mouth is so big that it can swallow any kinds of fish whole. Of course no one has ever seen a kraken. Tennyson’s poem is from 1830. Giant deep sea squid have only recently been discovered. The poet’s description of the fearful sea monster also comes well before Jules Verne wrote of Captain Nemo’s struggles with a giant squid in his famous adventure novel Twenty Thousand Leagues Under the Sea (1870). Today, we know plenty of real sea creatures to make us shiver (= shake in fear). Here is a list of real, “terrifying” deep sea creatures. The giant squid is just one of them. 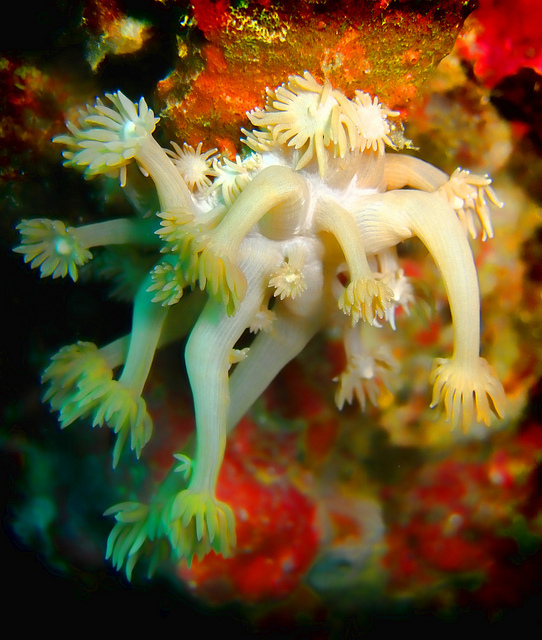 Or here is a photo gallery from National Geographic which shows you some of these creatures from another cute angle. Now let’s read and explain Tennyson’s poem line by line. By the way, the poem has an original structure: 15 lines. So it’s not a sonnet, which is a more classic form (having 14 lines). It also has an interesting haphazard (= random) rhyme scheme. Beneath is another word for under. Abysmal means like an abyss, which is a very deep place. Uninvaded means not disturbed, but it also means unconquered. Together, the image is of a powerful creature that no one has ever touched. …Around his dark sides that lie in shadow. Shadowy also means vague. It’s a nice image, because the Kraken is shadowy and mysterious, as no man has ever seen it. … very big sponges (think of Sponge Bob from the famous animation series) that have been growing for a thousand years or more (“millennial” comes from millennium = 1000 years). A grot or grotto is a cave. Winnow = fan. So the polypi fan with their huge arms the sleeping green of the sea. Hath = an old form of has. For ages = a very long time. Lain = the third form of lie. Batten = feed yourself fat. So the Kraken is growing fat in his sleep. His diet consists of very big sea-worms. Yum! But the Kraken will not sleep forever. The latter fire = the end of the world. On Doomsday the burning of the world will make the seas hot. Then humankind and angels will see the Kraken, but only once. He will rise out of the sea and make a big noise (“roar”) but once he’s on land he will die. Yup, the fact that the Kraken will die once he hits earth is a big of an anti-climax. Hope you liked reading this! Next Post Zipf’s Law or Which English Words Should You Know? Dear Jacqueline, This is one of my students playing a joke. Is it possible to remove the comment supposedly by “Tim Lerts”?